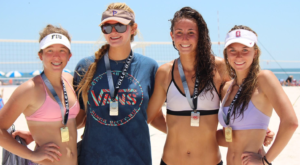 Abbie Hughes and Jordan McKinney pulled off a huge championship win last weekend taking the 18U Gulf Coast Regional Beach Junior Volleyball Championship in Gulf Shores Alabama. The competition at this event was as good as it gets with fifty-five teams from around the country competing in the 18U Open Division. Abbie and Jordan had to work hard for two days to battle their way into the championship. In the championship, they faced the number one seeded team that was comprised of two really talented players. Both players are beach volleyball college commits, one going to Pepperdine and the other Florida State. There was simply no stopping Abbie and Jordan. They played hard, executed well, and emerged with the championship. Abbie and Jordan are both highly ranked nationally, and both of them are already committed to play beach volleyball in college. Abbie has committed to Florida International University to play both indoor & beach, and Jordan has committed to Stanford to play beach volleyball. This is not the first time these two amazing beach volleyball players have found themselves competing to win a major championship. 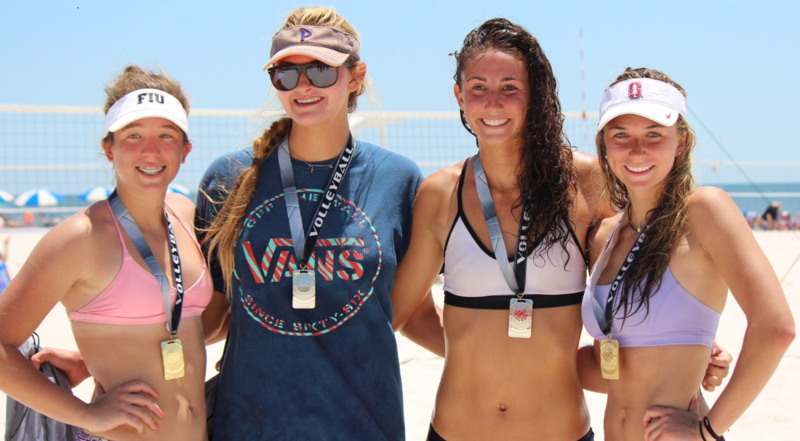 Last year they placed second in the USA National Beach Volleyball Championships, and you can always expect to see them competing to win any tournament they enter. Watching these two battle in the championship was a real treat. These are two very talented junior beach volleyball players who find a way to win. They are both extremely dedicated to the game and to the Ohio Valley Beach Volleyball program. They come to work every day to get better. This was a huge win for the pair and for our club. We are so proud of both of them, and we can’t wait to see what they will do the rest of this season. Ladies, take a moment and make sure to appreciate this win, and be proud of your efforts because this a big victory. You are both such hard workers, and we are thrilled to have you both as key players and great examples for our club. Very well done ladies!